Last weekend, Ross and I made our first visit to Ruidoso, a touristy kind of ski town with a casino in New Mexico. I’d booked Ross a gig playing music for a yoga class there, so we headed in a few hours early to explore. It reminded me of Estes Park, Colorado, the community at the base of the Rocky Mountains. There were tons of cute galleries and shops, including a boutique called 25th in Mid that I will definitely go back to for US-made tops at affordable prices. We also loved the bookstore, which also carries amazing backpacks and purses, games and gamer toys that are really fun. I definitely want to return and visit the winery, but I did visit a local coffee shop for gelato, which was delicious despite the clueless staff. Ruidoso was a fun place to spend a day or a half day, and it’s an easy trip from Roswell or Alamogordo. Have you visited Ruidoso? Ross and I have always wanted to visit New Orleans. Mainly for the music, although we were certainly interested in the food and the history. Although financially we weren’t in a position to “do it all” on this trip, we decided to make a quick visit. An old friend of mine lives in New Orleans and he isn’t in the best of health, so we made it a priority to visit with him when we passed through town. When we first entered Louisiana, we could tell this part of the Deep South was unique. The trees and swamps set it apart from earlier in our travels, and as we made it to New Orleans (after TONS of rush hour traffic), we could see there really was something special here, between the architecture and the people and everything else. We only had a few days to visit, so we resolved to enjoy a quick stay but knowing we would return at a later date. My friend Eric, with too typically unfortunate timing, had to leave town for a gig. Thankfully he made time to meet us for dinner our first night in the city. He recommended a place in the French Quarter for Uber to drop us off after we got settled at the RV park (New Orleans at rush hour is awful! ), and we loved exploring the local music store and quirky shops before he picked us up and we headed to Whole Foods, a perfect dinner choice as it could accommodate all of our food allergies and preferences. After we caught up on years of life and music in a few hours, he gave us a ride back to our RV park, Jude Travel Park of New Orleans, which was really considerate. He made sure to fill our ears with the great music of New Orleans on the way! We had a wonderful visit with him and his daughter, Lola. We had two more full days ahead of us. Without a car, our options were an Uber ride or a super cheap bus. This park was extremely convenient for both and we highly recommend it for that, the hot tub and pool, and the many cats in residence! We would happily stay again. It costs about $30/night which makes it a pretty good deal locally. It’s not a scenic location but it’s a perfect home base to see the city. The showers are nice too. Ross had to teach so the next day was focused on that rather than sight-seeing. I made sure to take advantage of the hot tub and we both relished having electricity and other hookups after some time boondocking. On our final full day, we had an ambitious day of playing tourist on the docket. We began by taking the bus downtown. After a long bus ride that showed us many aspects of the city, we transferred to a trolley – but I managed to get us on the wrong one! We ended up near Loyola University, and while it was cool to see the area, I was thankful we could call an Uber to get us to our next destination for a tour of the Garden District. 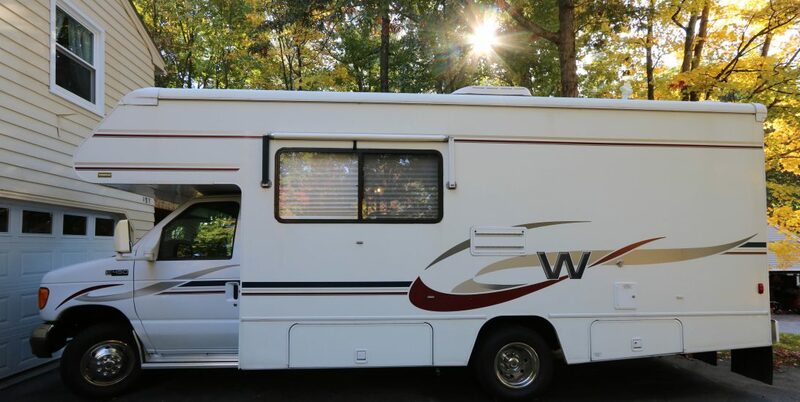 The hosts at the RV park offer great maps and two free walking tour guides to help you during your visit. I loved following their Garden District tour, and Ross went along for the ride. It begins at a great building with a bookstore, cafe and more to fuel your travels, and it includes fun facts about the historic homes you’ll pass. 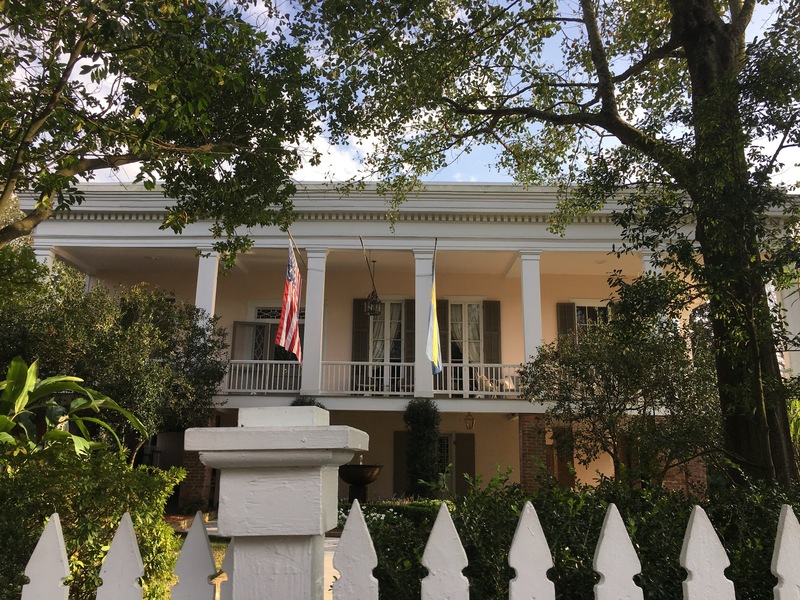 I loved gawking at the beautiful architecture and seeing the homes ready for Mardi Gras. If it was in the budget, there would have been a great restaurant to stop at afterwards too – and if you start it early enough you can tour the creepy cemetery too. (Ross isn’t a morning person, so we skipped that in favor of a relaxed afternoon and evening). 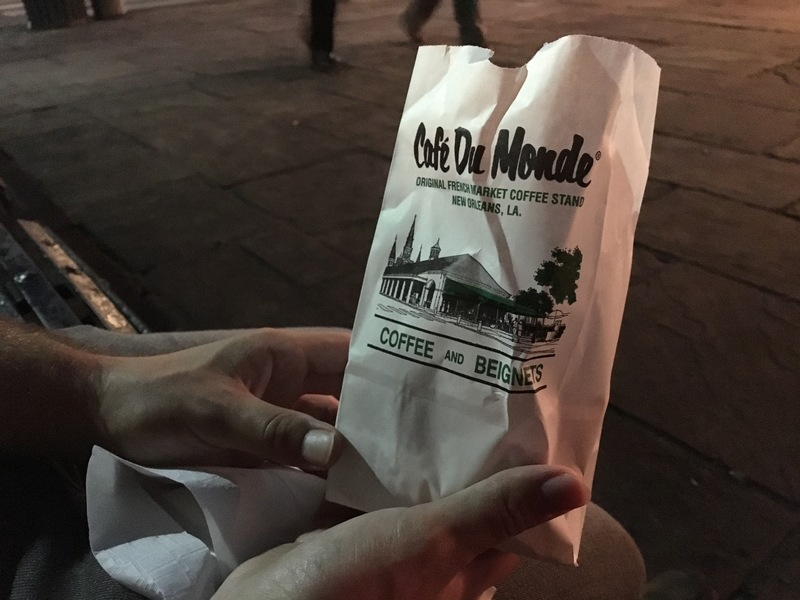 After our tour, we went on a grand walking adventure through much of the rest of the city, and we managed to see many of the tourist spots and visit Cafe du Monde for beignets. (I had a tiny bite due to the gluten, but Ross enjoyed them.) 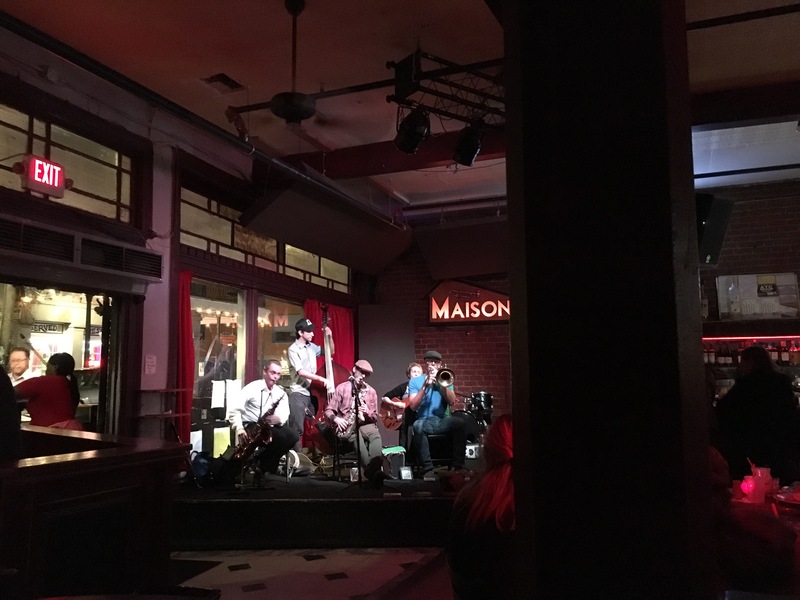 When we got back to the French Quarter, Ross expressed his desire to have a beer and listen to some live music while he was here, so we made that the evening’s plan. I did some research and found us a restaurant that could accommodate my dietary needs and we settled in for an excellent performance by local musicians. After two beers and a meal we called the RV park to take advantage of the other feature that makes their location a bargain – a shuttle service for $5/person to and from the French Quarter! We were repeatedly struck by how unique this area is. Residents told us they often feel abandoned by their government, so they persevere and make do in a way we haven’t encountered elsewhere. 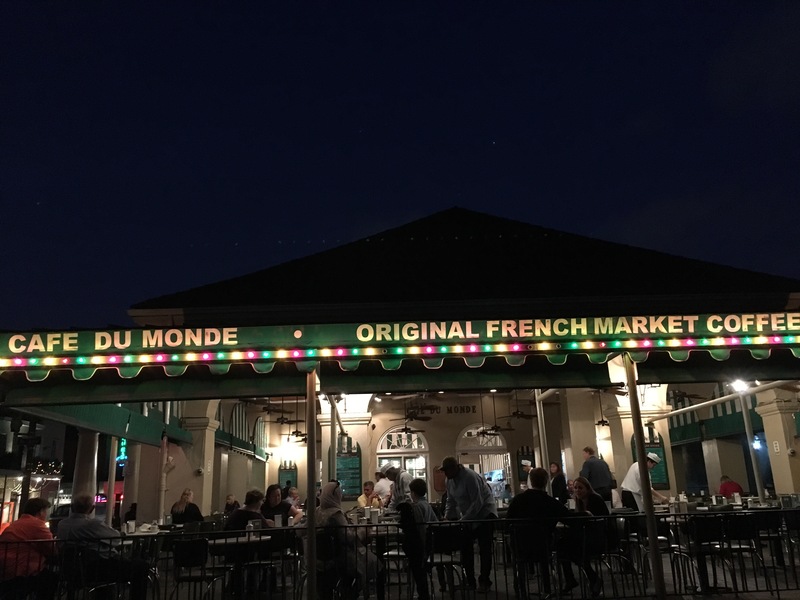 People are smart and cultured and we felt really lucky to get a taste of what makes New Orleans special. We are really looking forward to returning on a future trip.